As christmas is now over for another year, so too is our christmas bucket list, this can only mean one thing... 'Hello!' 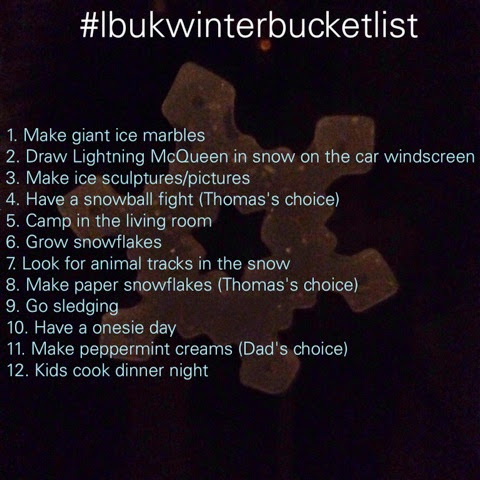 Winter bucket list! I'll be posting a round-up of our christmas bucket list next week, but didn't want to wait to make a start in our winter bucket list. With the threat of snow at the moment, I'm hoping we might even be able to do a couple before next weekend and we go back to work on 5 January. And if we have no more snow and cold weather (like last year!) we'll be abandoning half of our winter list. Last year we had to abandon everything because it was all outdoor, snow or frost activities! 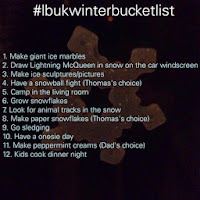 Do you have a winter bucket list? What's on yours? Thanks Louise, we do love our bucket lists. They help us get some of the seasonal family activities done, which often get missed. I do love a bucket list! I haven't come up with one for winter as I tend to avoid going out when it's cold haha - roll on springtime!